It's definitely a forgotten yet effective marketing method...personal name branding I mean. The internet marketer and online business own of today's world have totally started to over look this very important method of making more sales. Now a day, people look more towards getting visitors to their site any way they can and adding people to their lists. Don't get me wrong. Both of those things are very important as well. Especially building your optin list. But, what happen to branding yourself? What happen to making it so almost everyone online in your field knows you by name and can associate your products to YOU personally. This is what most people are, in fact looking to do, they've just gotten side tracked with the Free advertising boom that's going on right now...and has be for a year or so. Branding your personal name, not your product or website name but YOUR personal name can do more then build more sales online. It can also help to get you recognized for what you do or have done. You could find yourself being invited to speak at conferences, seminars, on teleconference calls and even start to charge upwards to $200.00 US an hour for YOUR consulting services. Imagine that, you up on the stage or you on the speakers end on the call. It could happen. But, people online today that are trying to pulling some cash are just flat out forgetting the importance of personal name branding. It's become such a forgotten thing that most people even stopped talking about it and teaching people HOW to go about it. It's the truth too. Most people online just don't know HOW to start name branding themselves. Well...no more need to worry about that any more. I've come up with a new piece of software that will literally let you place your content, any content, all of the web worldwide and with in only seconds. You write an article to help promote your website and you submit it to all your usual ezine publishers. THEN, you use the 'New Branding Syndicator' and in just seconds you can also have that same article published on tons of websites worldwide. Your articles exposure would more then double in most cases AND...any time you updated or changed the article, it would AUTOMATICALLY change on all of the those websites hosting it as well. INSTANTLY! The possibilities are truly endless with this software. The actual software itself could, in all reality be used to syndicate almost anything you would like. Sales letters, articles, ezines, affiliate marketing tools...anything. BUT, most importantly. You will start to personally name brand yourself online. The more people know who you are, the more potential sales or commissions you will start to make. It's been proven countless times. If people know who you are, they'll buy (in most cases) just because YOUR name is on the product. Personally. I found that my sales started to skyrocket the more I became known online. Now, I'm no Terry Dean or Jimmy D. Brown but, I am getting my name out there and more and more people are starting to know who I am. This has all been done through the POWER of personal name branding. The method by itself is simply outstanding and more then worth the time and effort. If I was asked right now what two things I would personally recommend to any newbie should do that's just starting out in order to build success online. 2. Start to personally name brand yourself NOW because it will pay off later!! This is one marketing method that I would honestly recommend to ANYONE who wants to start seeing huge profits online. AGAIN: The more people know who YOU are the more likely they are to purchase YOUR product or click on YOUR links. Starts Building Your Personal Name Brand - You will star to see your name in lights all over the web. YOUR content and YOUR name. Syndicates Your Sales letter In Seconds - If you're selling a product with resell rights, you can literally syndicate the sales letter making it easier on your customers. When ever you update the sales letter...it will automatically update worldwide with in seconds and with no effort! Adds More Subscribers To Your List - This is something new actually and I just thought of it. You can start an ezine referral program offering your subscribers a Free ad, Free e-book or what ever. Then, use the 'Name Branding Syndicator' to literally syndicate a copy of your ezine mailing WITH OUT your sign up info and have your subscribers place (the simple...one line of code) your syndicated ezine with their personal referral info on their website. This will get your subscribers involved in your ezine more AND...help to build your list by leaping bounds! Completely Hides Your HTML Code - With this easy to use software, you can easily hide your HTML source code from prying eyes making your site more secure and safe for your customers and visitors (right click on this page and view the source...tell me what YOU see)! Easily Updates Your Link Trading Images - If you like to trade links with other webmasters, you and instantly update the banners or images you are using with the 'Name Branding Syndicator'. Builds Search Engine Link Popularity - The more you use the 'Name Branding Syndicator' the more YOUR websites URL will be in other webmasters HTML code thus building your total link popularity and helping you to get a high search engine ranking. Provides Total And Complete Control - When you get your copy of the 'Name Branding Syndicator' today you will gain instant control over how your content looks on others websites. Your content will look exactly how YOU want it to look and not how others do. Doubles Or Even Triples Your Article Exposure - Sending your articles out to publishers for ezine publication is one thing. 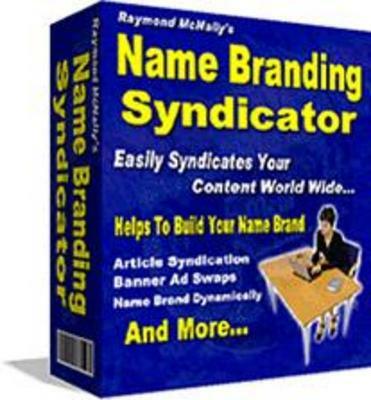 BUT, once you download your copy of the 'Name branding Syndicator' you will also be able to instantly and easily syndicate your articles on websites worldwide with one simple line of code. These are just a few of the things you can do and get out of using the 'Name Branding Syndicator'. I'm sure with a little imagination and some thought you will be able to come up with hundreds of other uses that will not only make your life easier but also build your profits online much faster. Automated marketing is one of the big keys to success. The less work you have to do to get the same result the better, right! Well, by using the syndication marketing method you and literally place your marketing on autopilot freeing up time and resources to focus on other marketing tactics. Say you are using articles to promote your website, all you would have to do is use the 'Name Branding Syndicator' and provide each webmaster with the ONE LINE OF CODE needed to place YOUR ARTICLE on their site/sites. NOW, a week later or so, you write another article. So, what do you do with this one. Well, all you have to do is open the 'Name Branding Syndicator', insert your new article and click a few buttons. Then just save the file with the same name as the original article and upload it to the same place on your server and your done. You article has just been AUTOMATICALLY changed on ALL of the sites hosting your content and the webmaster didn't have to change a single thing and YOU didn't have to resend out announcements or contact tons of people again. The 'Name Branding Syndicator' does it all for you. Articles aren't the only thing you do this with though. If you are trading links with other webmaster you can use the software and INSTANTLY have your images or links change on their sites with out anyone thing being done except uploading a new file with the same name as the last. Imagine the time you would be saving yourself! Now this is exiting. Not only can you literallyplace your marketing, article announcements and name branding on autopilot, you can also start to resell the software instantly right from your own website and keep every penny of every sales made. You get an instant automated marketing tool and a new and much needed product to sell at the same time. You can't beat that now can you? The best part is, this software is really a needed thing. People need to get their names out their more and this software will not only get your name out on the web more but...it will also dynamically update any content you want it to worldwide. AGAIN: The possibilities are truly endless. But...the choice is yours! Big Business Branding On A Small Business Budget Plr!